"The Injector" can be used for oily, sticky, static prone or moisture-laden debris. It works by continually administering fine powders such as Lime, Diatomaceous Earth, or Bicarbonate of Soda, directly into the collector, or duct system. During this process, the debris mixes with, or is absorbed by, the injected powder. By this process, the static pressure in the collector is reduced, greatly enhancing the collectors airflow, ability to clean itself, & increasing filter life by, as much as 1. The basic models are controlled by hand, however a fully automated unit is available. The automated unit will sense the pressure drop in a collector & automatically increase or decrease the amount of powder required. The I.S. series Injectors come in two sizes - 30 gallon and 55-gallon drums. Special sizes are available upon request. Though not certified or tested, as a fire or explosion suppression system, the Injector can greatly reduce the risk of collector or duct fires by creating a "Fire-Inhibiting Environment". 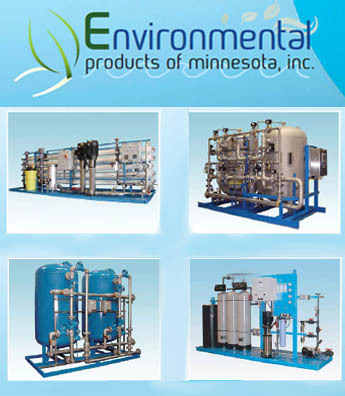 Environmental Products of Minnesota, Inc. offers a wide range of heat exchangers and heat recovery systems, focusing on tube & shell design. Our heat recovery systems will reduce operating costs at your business by improving operating efficiencies by recovering heat that is currently ventilated out of the facility.